In terms of engineering, bridges are discussed by design or type (beam, arch, truss, cantilever, suspension, or moveable); length (usually expressed in terms of clear or overall span); and materials (stone, wood, cast and wrought iron, and what we use today - concrete and steel). The purpose of this contextual essay is to provide parameters of value and significance so that we can focus our attention on those bridges - globally - that best illustrate the history of bridge building, and to encourage their preservation. Be an outstanding example of a type which illustrates a significant stage in bridge engineering or technological developments. A World Heritage bridge, like other properties, must meet the test of authenticity in design, materials, workmanship, or setting (the Committee has stressed that reconstruction is only acceptable if carried out on the basis of complete and detailed documentation of the original artefact and to no extent on conjecture). The criteria of authenticity may apply to Japanese bridges like the Kintaikyo spanning the Nishiki River in Iwakuni or Palladio's bridge over the River Brenta at Bassano a Grappa near Venice (Italy). In the same context, some bridges have been moved when unable to function at their original location. It is not unusual in the USA, for example, to relocate a metal truss bridge to a less travelled road when it can no longer handle the traffic; the same probably holds true for other countries. This is within the functional tradition of some bridge types and should not be viewed as a negative factor in determining the integrity of a relocated structure. The definition of authenticity is in the process of being expanded to include intangible values such as a bridge that embodies the spirit or character of a people or place, as New York City is embodied in the Brooklyn Bridge, San Francisco in the Golden Gate, London in Tower Bridge, Sydney (Australia) in the Harbour Bridge, or Bosnia-Herzegovina in the recently destroyed Stari Most in Mostar. Bridges nominated for World Heritage listing also must have legal protection and management mechanisms to ensure their conservation. The existence of protective legislation at the national, provincial, or municipal level is therefore essential and must be clearly stated in the nomination. Guidelines for nominations state that each property should be compared with properties of the same type dating from the same period, both within and outside the nominating State Party's borders. For the purpose of this contextual essay, bridge design and construction is dealt with chronologically by material and by type. In addition to the obvious evaluation factors as age, rarity, integrity, and the fame of the builder, consideration also is given to the substructure (piers, abutments, foundation), the superstructure (beam, arch, truss, suspension, and combinations thereof), the materials of construction (their strength and properties), the evolution of construction techniques, and whether the bridge advanced structural theory or methods of evaluating material behaviour. Bridges discussed in this essay illustrate important types or technological turning points and are listed at the end. Some, like the Pont du Gard (France) and the Iron Bridge (UK), are already inscribed on the World Heritage List. Others may be candidates for listing given adequate study, comparison, and evaluation. Not every potential World Heritage bridge candidate is cited. It is the job of TICCIH and its member countries to identify and make a case for outstanding bridges so they can be appreciated and protected like the great architectural and natural monuments already designated. The first bridges were natural, such as the huge rock arch that spans the Ardèche in France, or Natural Bridge in Virginia (USA). The first man-made bridges were tree trunks laid across streams in girder fashion, flat stones, such as the clapper bridges of Dartmoor in Devon (UK), or festoons of vegetation, twisted or braided and hung in suspension. These three types - beam, arch, and suspension - have been known and built since ancient times and are the origins from which engineers and builders derived various combinations such as the truss, cantilever, cable-stayed, tied-arch, and moveable spans. The essential difference among types is the way they bear their own weight - the "dead load" and the "live load" - a person, the railway train, wind, or snow that is applied to the bridge. The weight of beam, truss, and girder bridges bears directly downwards from their ends on the ground, piers, or abutments. Arch bridges thrust outwards as well as downwards, acting in compression. The cables of suspension bridges act in tension, pulling inwards against their anchorages. If two or more beam or girder spans are joined together over piers, they become continuous, a form favoured by European engineers, who had the mathematical knowledge to analyse the indeterminate stresses introduced by such systems. A case in point is the Town lattice truss invented by Ithiel Town, an American, in 1820, which is a rare instance of reverse techno- logical transfer. The form originated in the USA, but was widely adopted in Europe, especially in iron railway bridges. 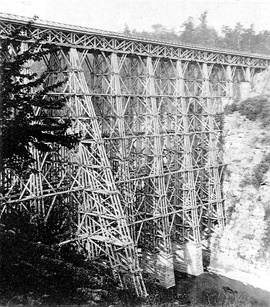 The lattice fell into disfavour in the USA, where a preference existed for statically determinate bridges of heavy timber, whose forces were easier to calculate. A more complex form of the beam is the truss, a rigid self- supporting system of triangles transferring both dead and live loads to the abutments or piers. A more complex form of the girder is the cantilever, where trussed and anchored ends of the girder support a central span. They were favoured for deep gorges or wide fast-flowing streams where false work, a temporary structure, usually of timber, erected to assist in the construc- tion of the permanent bridge, is impossible to build. 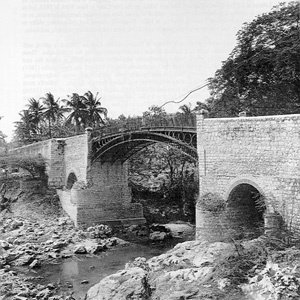 The three principal types - beam, arch, and suspension - often were combined in a variety of ways to form composite structures, the type selected depending on the nature of the crossing, the span required, the materials at hand, and the type of load anticipated - pedestrian, vehicular, railroad, or a channel of water as in aqueducts. Other than the clapper bridges of England and similar spans surviving in other countries, bridges dating from prehistoric periods are rare. Bridges of twisted vines and creepers found in India, Africa, and South America, the ancient cantilevers of China, Kashmir, and Japan, if any survive, or the wooden arches of Japan may be candidates for World Heritage listing because they perpetuate primitive ingenuity and craft technology that is important to recognize. Since some of their materials cannot be original, these structures will have to pass the test of authenticity. In 51 BC, during the Gallic War, Caesar attested to the construction of narrow wooden bridges by Gallic builders over wide rivers as the Loire, Seine, and Allier of 600ft (200m) span, used by pedestrians and domestic animals. The stone vault probably first sprang forth in Anatolia and the Aegean region of Asia Minor (central and western Turkey) in the 2nd millennium BC for short spans in civic construction. The Mesopotamian civilizations introduced the first major development of brick vaulting in the royal palaces, and also probably the first important arch bridges in the 6th century BC. The greatest bridge builders of antiquity were the Romans. They applied a civil engineering repertoire on an unprecedented grand scale and achieved impressive results. Roman engineering introduced four significant developments to the art of bridge building that never had been prominent before: the discovery and extensive use of natural cement, development of the coffer dam, perfection and widespread application of the semi-circular masonry arch, and the concept of public works (Figure 1). In these important respects, the Roman engineer vastly improved upon the efforts of his predecessors. Public water supply was the most significant aspect of Roman civil engineering: nothing like it had been achieved before nor was it to be emulated until the 19th century. Structural evolution achieved by Roman engineers is manifest in aqueducts, dam construction, and highway bridges that relied on the development of concrete, and a growing awareness of its strength. The Romans mixed a cement, pozzolana, found near the Italian town of Pozzuoli (ancient Puteoli), with lime, sand, and water to form a mortar that did not disintegrate when exposed to water. It was used as a binder in piers and arch spandrels, and mass-formed in foundations. Coffer dams (temporary enclosures built in river beds to keep the water out while the foundations were established) were made by driving timber piles into the river bed, removing water from the area enclosed, and then excavating the soft ground inside. Despite the use of coffer dams, Roman bridge foundations typically were not deep enough to provide sufficient protection against scour. Most of the Roman bridges that survive are those built on solid rock such as the Pont du Gard aqueduct (c AD 14) near Nîmes (France), the Alcantara Bridge (AD 98) on the Spanish-Portuguese border, and the aqueduct at Segovia (AD 98), which are three of the most famous surviving Roman bridges and aqueducts. Scholars have researched Roman bridges and aqueducts for many years, so it should be possible to arrive at a well reasoned selection of Roman-built bridges for World Heritage listing. Bridge building in Asia extends back earlier in time than in Europe. Because structural concepts of suspension, cantilever, and arch were first developed there with great sophistication, every effort should be made to identify surviving examples (Figure 2). China was the origin of many bridge forms: Marco Polo told of 12,000 bridges built of wood, stone, and iron near the ancient city of Kin-sai. The first chain-link suspension bridge, the Panhogiao or Panho Bridge (c206 BC), was built by General Panceng during the Han Dynasty. In 1665, a missionary named Kircher described another chain-link suspension bridge of 200ft (61m) made up of twenty iron links, a common bridge type built during the Ming Dynasty that was not adapted until the 19th century in America and Europe. China's oldest surviving bridge, and the world's oldest open-spandrel segmental arch, is the Zhaozhou Bridge (c AD 605), attributed to Li Chun and built south-west of Beijing in Hebei Province during the Song Dynasty. Its thin, curved stone slabs were joined with iron dovetails so that the arch could yield without collapsing. This technique allowed the bridge to adjust to the rise and fall of abutments bearing on spongy, plastic soils and the live loads of traffic. Following the decline of the Roman Empire with its many engineer- ing achievements, beam, arch, suspension, and cantilever bridge building flourished in China while languishing in Europe for nearly eight centuries. Chinese bridge builders experimented with forms and materials, perfecting their techniques. Selected examples, found in the countryside and parks, may be candidates for World Heritage listing. 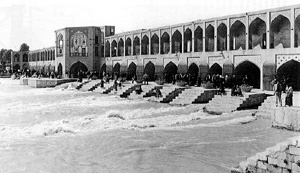 Other fine bridges survive in Iran, such as the Bridge of Khaju at Isfahan (1667), with eighteen pointed arches, carrying an 85ft (26m) wide roadway with walled, shaded passageways, flanked by pavilions and watch towers. This magnificent bridge, combining architecture and engineering in splendid functional harmony, also served as a dam, and included a hostelry where travellers found cool rooms for rest and refreshment after hot desert crossings (Figure 3). 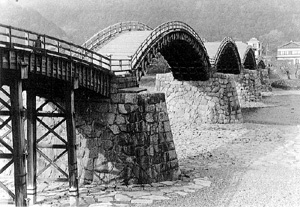 Picturesque bridges, such as the Kintaikyo at Iwakuni (1673), with its five wooden arches intricately wedged, slotted, and dovetailed together, are found in Japan. The superstructure of this bridge has been rebuilt for centuries (the central three arches every 18- 22 years, and the side spans every 36 years), maintaining the fine craft tradition of the bridge keepers for centuries (Figure 4). Shogun's Bridge (1638), crossing the Daiya-gawa River in the sacred City of Nikko, is the oldest known cantilever. The bridge was badly damaged in the typhoon of 1902, rebuilt, and exists today bearing foot traffic. It consists of hewn stone piers pierced with rectangular holes that permit the insertion of tightly fitting cut-stone struts, two anchor spans, timber beams jutting out in cantilever form, and a suspended span. Figure 3 Bridge of Khaju (1667), Isfahan (Iran), combining architecture and engineering in splendid harmony, functioned as a bridge, dam, and a resort for thirsty travellers coming off the desert. The revival of bridge building in Europe following the fall of the Roman Empire was marked by the spread of the pointed arch westward from its origins in the Middle East. The pointed arch typically was a Gothic architectural form important structurally in the development of palaces, castles, and especially the cathedrals of western Europe, but not very important for bridges. Medieval bridges continued such multi-functional traditions as the Isfahan Bridge in Iran. Chapels, shops, tollhouses, and towers adorned fortified bridges such the 1355 Pont Valentré at Cahors (France) or the Monnow Bridge (1272, 1296) at Monmouth, Wales (UK), which were built with defensive ramparts, firing slits, and drawspans. Christian religious orders formed after the fall of the Roman Empire greatly assisted travellers by building bridges. In western and central Europe, religious groups managed popular financial institutions, with Papal sanction, both for bridge construction and for hospitals. The influence of these groups lasted from the end of the 12th to the early 14th century, and their perseverance ensured the construction of major bridges over wide rivers as the Rhône and the Danube. The bridge over the Rhône at Avignon (1187), for example, a wooden deck on stone piers, was built by such an order under the inspired vision of a young shepherd, later canonized as St Bénézet for his accomplishment. The four surviving arches, dating from the bridge's rebuilding around 1350, rank as one of the most remarkable monuments of medieval times in view of the 101-110ft (31-34m) elliptical arches with radii varying at the crown and haunches. As the Middle Ages drew to a close, stone arches of remarkable spans were built in mountain valleys where rock abutments provided solid foundations for spans in excess of 150ft (50m), such as the Vieille-Brioude and the Grand Pont du Doux in France. The great era of medieval bridge building was followed by the Quattrocento, the transition period from the medieval period to the Italian Renaissance, when the confidence and unbounded enterprise of engineers was manifested in bridges like the 1345 Ponte Vecchio, an early Florentine bridge in Italy, designed by Taddeo Gaddi, that carries a street of goldsmiths' shops on three segmental arches. This was followed by the technical efficiency and artistic advancement of Renaissance ideals of civic order during the Neo-Classical period of the 17th and 18th centuries, represented by long span and multiple stone arches: eg Santa Trinità (1569) in Florence, the Rialto (1591) in Venice, and the Pont Neuf (1607) in Paris. These bridges, which are among the most famous bridges in the world today, are all on the World Heritage List, although only as components of historic town centre inscriptions. Renaissance engineers had learned much about foundations since Roman times, though they rarely were able to excavate deeply enough to reach hard strata. They had, however, perfected techniques of spread footings - wide timber grillages resting on piles driven into the river bed upon which stone piers were laid. In the foundation of the Rialto Bridge, designer Antonio da Ponte drove six thousand timber piles, capped by three stepped grillages so that the abutment stones could be laid perpendicular to the thrust lines of the arch. Though built on soft alluvial soils, the bridge continues to support a street of jewellery shops enjoyed by tourists four centuries later. The end of the Italian Renaissance witnessed a new vision of bridge construction. More than merely utilitarian, bridges were designed as elegant, grand passage-ways that were part of the visual perspective of the idealized cityscape - major accents to the totally redesigned merchant and capital cities. No country attempted to advance this concept more than France at the end of the 16th century, where a national transportation department of architects and engineers was set up, responsible for designing bridges and roads (Ponts et Chaussées). This corps of specialists gave the Neo-Classical period a range of monumental and elegant bridges on rivers as the Loire (Blois, Orléans, Saumur) and the Seine in Paris. This model spread all over Europe, producing large monumental urban bridges in capitals such as London, Saint Petersburg, and Prague. In Italy, Bartolomeo Ammannati evolved a new form for the Santa Trinità Bridge - a peculiar double-curved arch whose departure from an ellipse was deliberately concealed by a decorative escutcheon at the crown. Its 1:7 rise-to-span ratio resulted in an elegantly shallow, long-arch span widely adapted in other bridges of the Renaissance. The bridge was reconstructed using original stones recovered from the river following demolition during World War II. By the mid-18th century, masonry bridge building had reached its apogee. French engineer Jean-Rodolphe Perronet designed and built the Pont de Neuilly (1774), the Pont de Saint-Maxence (1785), and the Pont de la Concorde (1791), the latter completed when Perronet was eighty-three. Perronet's design goals were to slim down the piers and to stretch arches to the maximum. The Pont de la Concorde still represents the perfection of masonry arch construction, even though sceptical officials forced Perronet to shorten the unprecedented centre span of the bridge to 92ft (28m). Long, elegant, elliptical arches, piers half their former widths, special machinery for construction, and the introduction of an architectural motif used until the 1930s, the open parapet with turned balusters, completed this outstanding bridge. Widened in the 1950s, its original appearance was carefully maintained. Another masterpiece of the French Classical style is the Pont de Bordeaux of nineteen arches, more than 1640ft (500m), completed in 1822. In the United Kingdom, a young Swiss engineer, Charles Labelye, was building the English equivalent of Perronet's bridges. On his first bridge, Westminster (1750) over the Thames, he developed the caisson, which made it possible for pier foundations to be built in deep, fast-flowing waters. To solve a problem that had confounded bridge builders since Roman times, Labelye used huge timber boxes constructed on shore, floated into position, and slowly sunk to the bottom of the river by the weight of the masonry piers being laid above. Fifteen semicircular arches, incrementally diminishing in length from the centre and rising in a graceful camber, set a high engineering and architectural standard that stood for over a hundred years. England's other great bridge designer during this period, John Rennie, built the first Waterloo Bridge in 1811. Its level road and arches lasted until 1938. Rennie's next great bridge was Southwark Bridge (1819), also over the Thames in London, which was built not in stone but in the new miracle material of the 19th century - cast iron. It had three arches whose central span of 240ft (73m) dramatically demonstrated the potential of the new material. Wooden bridges are some of the most ancient. The first Roman bridge, the Pons Sublicius (c 621 BC), was a wood-pile structure over the Tiber in Rome, extending pedestrian access to the Aventine Hill. The earliest detailed description of a wooden bridge, a timber-pile structure over the Rhine constructed in 55 BC, was written by Julius Caesar in his De Bello Gallico. The best extant model of this type survives today over the Brenta at Bassano a Grappa, near Venice. It was built by Palladio in 1561, destroyed in 1945, and reconstructed identical to the original in 1948. By the mid-18th century, carpenters working in the forested regions of the world further developed the timber truss bridge. The most famous were two Swiss brothers, Johannes and Ulrich Grubenmann, who built bridges at Schaffhausen, Reichenau, and Wettingen that combined diagonal struts and trusses to produce remarkably long spans for their time. The Schaffhausen Bridge (1757), over the Rhine in northern Switzerland, had two spans, 171ft and 193ft (52m and 59m) respectively, which rested lightly on an intermediate pier when loaded. It was burned by the French in 1799 during the Napoleonic Wars. One of the few Grubenmann bridges to survive is Rumlangbrücke (1766), with a span of 89ft (27m). European engineers visiting the New World during the 19th century marvelled at the spans achieved by American timber bridges. Especially noteworthy was Louis Wernwag's 340ft (104m) arch truss of 1812, the "Colossus," over the Schuylkill in Philadelphia, the longest spanning bridge in the world at the time. Covered bridges, sheathed in wood to keep the structural timbers from deteriorating, are an icon of the American landscape. Outstanding spans that survive today include the Cornish-Windsor Bridge (1866) over the Connecticut River and the Bridgeport Bridge (1862), whose clear span of 208ft (63m) makes this gateway to the California goldfields the second longest single span. According to the National Society for the Preservation of Covered Bridges Inc, some 800 wooden covered bridges survive in the USA, more than in any other country (Figure 6). Regardless of the capability of advanced societies like the Romans to build bridges in stone, the material for the ages, its cost always remained a problem. Wooden bridges were an economic alternative important to every civilization during all historic periods from prehistoric times to the first American settlement, from classical Rome to the European Enlightenment, including China, Japan, and south-east Asia. Wooden bridges have played a major role in the history of human development. The architectural varieties and structural types - girder, arch, suspension, truss, pontoon, and covered - were numerous. By virtue of the nature of their material, extant examples are scarce, as is the historic record. Nature, acts of God, war, and arson have decimated wooden bridges throughout time. A special global effort should be initiated to identify, access, and protect wooden structures of all kinds. A group of experts should be convened in the USA and in other parts of the world where timber bridges survive to recommend a selection for nomination to the World Heritage List. Thanks to Galileo, Renaissance mathematicians and scientists understood beam action and the theory of framed structures. The truss, used by the Romans as stiffening on the Rhine bridge (55 BC) and in roof structures, was refined by the Italian architect- engineer Andrea Palladio. His classic treatise on Greek and Roman architecture, I Quattro Libri dell'Architettura, was published in 1570, and was widely distributed after translation into English by Isaac Ware in 1755. It contained the first drawings of a truss, the simplest and most easily visualized form for transferring both dead and live loads to piers and abutments, accomplished by a rigid self-supporting system of triangles. Palladio built several truss bridges, the most important being the Bassano Bridge (1561) over the River Brenta in the Veneto region in northern Italy. Destroyed several times, it has been carefully rebuilt faithfully following the original layout and exists today as the only example of one of Palladio's bridges. The truss form, derived from the Romans, represents one of the Renaissance's most significant contributions to bridge building. Renaissance engineers also devised daring innovation in arch forms - the segmental, elliptical, and multi-centred. The Hungarian, Janos Veranscics, reviewed these and other achievements in the structural arts at the end of the Renaissance in Machinae Novae, published in 1617. Several concepts that later became standard bridge practice first were illustrated in this volume: the tied arch, the Pauli or lenticular truss (in wood), the all-metal truss (in cast brass), a portable, metal chain-link suspension bridge, the use of metal in reinforcing wooden bridges, and the eye-bar tension member (again in brass). In 1716, Henri Gautier published Traité des Ponts, the first treatise devoted entirely to bridge building, during the Age of Reason when empirical bridge design gave way to rationalism and scientific analysis. The book became a standard work of reference throughout the 18th century. It covered both timber and masonry bridges, their foundations, piers, and centring. A far-sighted policy that led to the first national department of transportation in France was started by Henri IV and Sully at the end of the 16th century. During the second half of the 17th century, it was reorganized by Colbert as the Corps des Ingénieurs des Ponts et Chaussées, a group of state architects and engineers, during the reign of Louis XIV. In 1747, the École des Ponts et Chaussées, the oldest academic institution in the world for civil engineering education in the design of roads and bridges, was started, with Perronet as its first director. The first theoretical studies concerning the stability of arches, transmission of forces, and the multi-radius form were conducted at the school by La Hire, Gautier, Bélidor, Coulomb, and Méry. Though extremely versatile, wood has one obvious disadvantage - it burns. Wernwag's Colossus, destroyed by fire in 1838, is but one example of many outstanding wooden bridges lost in this manner throughout history. There was another material, however, whose use at the end of the 18th century offered bridge engineers an alternative to the traditional materials of timber, stone, and brick. Although it had first been used in antiquity, iron was the miracle material of the Industrial Revolution. The Greeks and Romans had used it to reinforce stone pediments and columns in their temples and iron links had been forged by the Chinese and used in suspension bridges. The successful smelting of iron with coke, rather than charcoal, by English ironmaster Abraham Darby in 1709 freed iron production from fuel shortage restrictions, made large castings possible, and facilitated creation of the arch ribs for the world's first iron bridge, built seventy years later. In 1754, Henry Cort of Southampton (England) built the first rolling mill, making possible the efficient shaping of bar iron; in 1784 he patented a puddling furnace by means of which the carbon content in cast iron could be reduced to produce malleable iron. These two milestones of metallurgy realized the potential of iron as a major building material. Bridges were one of the first structural uses of iron, preceded only by columns (not yet beams) to support the floors of textile mills. The first successful all-iron bridge in the world was designed by Thomas Farnolls Pritchard, an architect who suggested using the material as early as 1773. Built by two ironmasters, Abraham Darby and John Wilkinson, to demonstrate the versatility of cast iron, the bridge spans 100ft (30m) over the River Severn at Coalbrookdale (UK), on five semi-circular ribs of cast iron. The Iron Bridge was followed by a succession of cast-iron arches built throughout Europe. Few cast-iron arch bridges were built in the USA as the iron truss, derived from wooden forms, was preferred. One iron arch, however, merits mention, as it is the oldest iron bridge in America. Dunlaps Creek Bridge (1839), designed by Captain Richard Delafield of the Army Corps of Engineers for the National Road in Brownsville, Pennsylvania, survives to this day, still carrying traffic (Figure 7). Because the material could be moulded into elaborate shapes, extravagantly decorative iron arches were used for pedestrian bridges on the grounds of estates and imperial palaces, such as Catherine the Great's Tsarskoye Selo in St Petersburg (Russia), or urban pleasure grounds, such as Central Park in New York City (USA). Both places have remarkable collections of cast-iron arch bridges. Engineers in the 19th century improved the technology of sinking foundations to bedrock. Up until that time, coffer dams and crude caissons were the only means by which foundations could be constructed in water. Their use was limited by the length of wooden piles and by soils that were unsuitable for pile driving because they were either too soft or too hard. Credit for developing the first pneumatic caisson belongs to William Cubitt and John Wright, who used the technique on the bridge (1851) over the River Medway at Rochester (UK). It was similar to the caisson developed by Labelye, but differed in that the chamber resting on the river's bottom was airtight and required workmen to enter by means of airlocks after the water had been driven out by pneumatic pressure. Working in this environment, men suffered from the little understood "caissons disease," now better known as "the bends." The eventual diagnosis of this condition permitted the construction of bridges of unprecedented scale, overcoming the impediment of deep, broad rivers. Isambard Kingdom Brunel used the technique for sinking the piers of his bridge at Chepstow, Wales (UK) and, on a much grander scale, on the Royal Albert Bridge (1859) over the Tamar at Saltash in Cornwall (Figure 8). Here, the central pier was built on a wrought-iron caisson 37ft (11m) in diameter, sunk to bedrock in 70ft (21m) of water and 16ft (5m) of mud. Another improvement in foundations in the early 19th century involved hydraulic cement. A better scientific understanding of the material by the Frenchman Vicat and the Englishman Aspdin and discovery of the material in a natural state in 1796 on the Isle of Sheppey in the Thames estuary, by Lafarge at Le Teil (France), and by Canvass White on the Erie Canal in New York in 1818, led to its use in sinking foundations by the new method of direct flow into coffer dams underwater, as at the suspension bridge at Tournon (France) in 1824. Hydraulic cement had the amazing ability to set under water, and was consequently used in aqueducts, piers and abutments, culverts, and locks. Following the construction of the Iron Bridge at Coalbrookdale, Thomas Telford, a gifted, self-educated Scottish engineer, built a number of cast-iron arches throughout the British Isles. 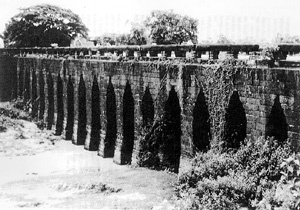 These included canal aqueducts, which were extraordinarily innovative arrangements in which the cast iron had real structural value. 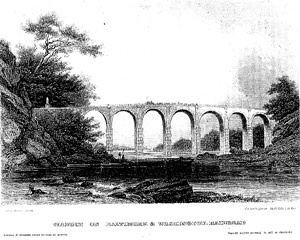 On both the Longdon-on-Tern (1796) and the Pontcysyllte (1805) aqueducts, the cast-iron sections that formed the side walls of the trunk were wedge-shaped, behaving like the voussoirs of a stone-arch bridge and bolted through flanges. Telford's most ambitious notion, however, was his proposal of 1800 for a single cast-iron arch of 600ft (183m) span over the Thames to replace Old London Bridge. An earlier proposal was unveiled in France by Montpetit in 1779 for a bridge of 400ft (122m) over the Seine, thought to have been the inspiration for Telford's idea. Even the young United States got into the act when Thomas Paine, the political philosopher, proposed an iron arch of 400ft span over the Schuylkill in Philadelphia. But the next most outstanding achievement after Coalbrookdale was the cast-iron arch over the River Wear at Sunderland (UK), because it actually was built. Completed in 1796 by Thomas Wilson, the bridge had an unprecedented span of 236ft (75m). Today, several collections of cast-iron arches survive in different countries, the largest being in the United Kingdom, six in the USA, a few in France and Spain, and a remarkable selection surviving in Russia, dating back to the reign of Catherine the Great. These need to be studied and a selection made for nomination. By 1800, most European engineers were open to using cast iron. Architects, however, preferred traditional materials such as granite and marble for the visible parts of buildings and wood for hidden structural parts like roof trusses, and did not accept cast iron as having aesthetic merit or structural value. In the USA, still blessed with abundant virgin forests, the early 19th century was the era of "carpenter engineers." Men like Timothy Palmer, Lewis Wernwag, Theodore Burr, and Ithiel Town followed British custom by conceiving and building truss forms predicated on intuition and pragmatic rules of thumb. Their craft tradition of knowledge, passed down from master to apprentice, contrasted with the scientific analysis and mathematical formulas practised by French government engineers. Models were built and loaded to failure and broken members replaced with stronger ones until the model supported loadings equivalent to a real live load plus a safety factor. Patents were granted in the USA for composite wood and iron bridges, transitional structures that capitalized on the availability of cheap timber. When the American iron industry caught up with Europe's by the mid-19th century, bridge building took the direction of composite pin-connected trusses, with sophisticated castings for joint blocks and compression members, and forged eyebars and wrought-iron rods for tension members, all fabricated to high tolerances. This allowed them to be assembled easily and inexpensively in the field by unskilled labour using simple tools and erection techniques. The system prevailed in the USA because that country lacked a skilled labour force, and the remoteness of many bridge sites hampered the use of sophisticated machinery or the shipping of large bridge parts over long distances. A spirited debate ensued between England and the former colony during the last quarter of the 19th century over which system was best: easily erected pin-connected trusses on the "American plan," or European-style riveted trusses. Even though the rigid riveted truss was of superior design, American bridges remained competitive in world bridge markets until the early 20th century because they were cheaper and swiftly erected. For years, the distinction of being the world's oldest surviving iron railway bridge has been accorded by scholars to the Gaunless Viaduct (1825), on display at the National Railway Museum, York (UK) (Figure 10). Designed by George Stephenson for the first railway, the 37 miles (23km) between Stockton and Darlington in north-east England, it consists of four 12.5ft (4m) lenticular truss spans with curved top and bottom chord members of 2.5in (6cm) diameter wrought-iron rods and five vertical iron posts cast integrally with the wrought-iron chord members. In the last 20 years an older bridge has been discovered in South Wales (UK) at Merthyr Tydfil, a major early 19th century iron-producing centre. Pont-y-Cafnau (Bridge of Troughs) is a unique cast-iron combined aqueduct tramroad bridge below the confluence of the Taff and Taff Fechan, built in January-June 1793 by Watkin George, Chief Engineer of the Cyfarthfa Ironworks, to carry an edge railway and water channel. An iron trough-like girder is carried in an A-frame truss of cast iron spanning 47ft (14.2m), held together by mortise-and-tenon and dovetail joints. The next extant iron railway bridge seems to be another recently discovered at Aberdare (1811), followed by Gaunless. The oldest still in service is Hall's Station Bridge, a Howe truss designed in 1846 by Richard Osborne, a London-born Irishman who worked as engineer for the Philadelphia & Reading Railroad, although its current use is vehicular and not rail. 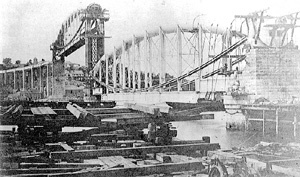 The first major iron truss with pin connections was built in the USA in 1859, and the earliest iron cantilever in Germany in 1867, over the Main at Hassfurt. 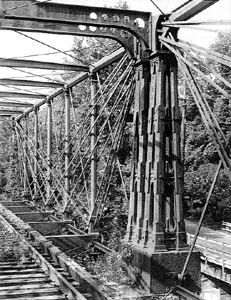 Another important composite iron truss surviving from the early period of iron bridge construction is the Bollman bridge (c 1869) at Savage, Maryland (USA) (Figure 11). Britannia Bridge (1850) across the Menai Straits, Wales (UK), designed by Robert Stephenson and William Fairbairn, was the prototype of the plate-girder bridge, eventually used throughout the world. Originally intended to be a stiffened suspension bridge of four spans, each span (459ft (140m) over the channel; 230ft (70m) land spans) consisted of paired rectangular wrought- iron tubes through which the trains passed. Although Navier published his theory of elasticity in 1826, so little was known of structural theory that Stephenson relied primarily on empirical methods of testing, modifying, and retesting a series of models to design the tubes. They were fabricated on site, floated into position, and raised into place by hydraulic jacks. Riveting was done both by hand and using pneumatic riveting machines invented by Fairbairn. So strong were the tubes that the suspension chains were abandoned. 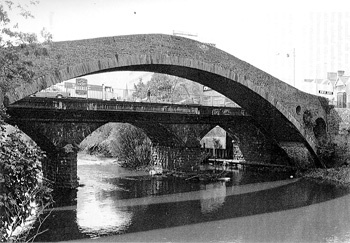 The bridge continued in service until irreparably damaged by fire in May 1970, when the world lost one of its most remarkable 19th century engineering monuments was lost, but the near-contemporary Conway Castle Bridge (1848) survives. Although the 19th century was marked by significant technological progress, such breathtaking achievement had its price. Three- quarters of the way through the century, two events, one on either side of the Atlantic, sobered the engineering profession. These took the form of accidents: the Ashtabula, Ohio, bridge disaster of 1876 in the USA, and the Tay Bridge disaster in Scotland (UK) in 1879. Forewarnings had occurred in Europe as early as 1847, when one of Robert Stephenson's composite cast and wrought-iron girder bridges over the River Dee on the Chester & Holyhead Railway collapsed. Three years later, 478 French soldiers were pitched into the Maine at Angers when one of the anchoring cables of a suspension bridge embedded in concrete tore loose during a storm, mainly owing to resonance oscillation and by the oxidation of the iron wires. The Dee Bridge disaster spurred the development of malleable wrought-iron girders, thought to be of safer construction. Collapse of the Basse-Chaine Bridge resulted in a twenty-year moratorium on cable-suspension bridge construction in continental Europe. It took the worst bridge disasters of the century in the USA, Great Britain, and France to usher in the development of standards, specifications, and enough regulation to protect the travelling public. The loss of 83 lives caused by the collapse of a cast- and wrought-iron truss in Ashtabula prompted an investigation by the American Society of Civil Engineers. The loss of 80 lives by failure of a section of the two-mile-long Tay Bridge resulted in similar inquiries in Britain. The reasons for these major failures were similar: ignorance of metallurgy resulted in uneven manufacturing methods and defective castings, and inadequate inspection and maintenance were inherent at both bridges. For the Tay Bridge, exceptionally strong vibrations due to dynamic wind stresses under a moving load created a lack of aerostatic stability and eventual failure. It took engineers another quarter-century to perfect bridge design according to advanced theories of stress analysis, understanding of material properties, and renewed respect for the forces of nature. A definitive understanding of the physical oscillations and vibrations of structures did not occur until the middle of the 20th century after the Tacoma Bridge collapse in the USA in1940. Advances in design theory, graphic statics, and a knowledge of the strength of materials by engineers such as Karl Culmann and Squire Whipple were achieved in the second half of the 19th century, but the factor that most influenced the scientific design of bridges was the railroads. Engineers had to know the precise amount of stresses in bridge members to accommodate the thundering impact of locomotives. 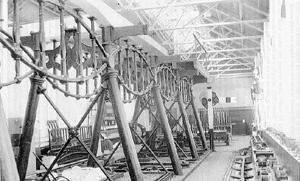 Founded on the pioneering work of the American Squire Whipple and other European engineers as Collignon, the last quarter of the 19th century witnessed broad application of both analytical and graphical analysis, testing of full-size members, comprehensive stress tables, standardized structural sections, metallurgical analysis, precision manufacturing and fabrication in bridge shops, publication of industry-wide standards, plans, and specifications, inspections, and systematic cooperation between engineers, contractors, manufacturers, and workers. The combined experience of the railroads, bridge manufacturing companies, and the engineering communities enabled the railroads successfully to tackle long-span iron and steel bridges and long-span trussed-roof train sheds, two engineering icons of the 19th century. The first practical design solution was obtained independently in the USA by Squire Whipple in 1847, and in Russia by D I Jourawski in 1850. Whipple had been working on the problem since before 1841, when he patented and built his all-iron bowstring truss bridge, which proved exceptionally suitable for short highway and canal spans. His book on stress analysis, A Work on Bridge Building, is recognized as the USA's contribution to structural mechanics for the period. His major breakthrough was the realization that truss members could be analysed as a system of forces in equilibrium, assuming that a joint is a frictionless pin. Forces are broken down into horizontal and vertical components whose sums are in equilibrium. Known as the "method of joints," it permits the determination of stresses in all members of a truss if two forces are known. Whipple clearly outlined methods, both analytical and graphical, for solving determinate trusses considering uniformly distributed dead loads and moving live loads. Over a dozen of Whipple's bowstring trusses survive as elegant illustrations of his breakthrough conclusions (Figure 12). The next advance was the "method of sections" published in 1862 by A Ritter, a German engineer. Ritter simplified the calculations of forces by developing very simple formulae for determining the forces in the members intersected by a cross-section. The third advance was a better method of graphical analysis, developed independently by James Clerk Maxwell, Professor of Natural Philosophy at King's College, Cambridge (UK), published in 1864, and Karl Culmann, Professor at the newly established Federal Institute of Technology (Eidgenossische Technische Hochschule) in Zürich (Switzerland), who published his methods in 1866. The solution of bending in a cantilever was developed over a long period of time, starting with Galileo's famous illustration of the wooden beam, anchored in the ruinous masonry wall, holding a stone weight at its end. Although it was not entirely accurate, subsequent solutions were discussed in terms of Galileo's cantilever. C A Coulomb in France hypothesized in 1776 that the flexural stress in a cantilevered beam had a maximum value in compression on the bottom edge and a maximum value in tension on the top with a neutral axis somewhere between the two surfaces. The problem of understanding bending moments in mechanical terms was described by Louis Marie Henri Navier in his Résumé de leçons données à l'École des Ponts et Chaussées in 1826. The Swiss mathematician Leonard Euler provided the solution to the elastic buckling of columns as early as 1759. Railroads, the transportation mode that revolutionized the 19th century, generated a bridge type that merits special attention. The limited traction of locomotives forced the railroad engineer to design the line with easy gradients. Viaducts and trestles were the engineering solution for maintaining a nearly straight and horizontal line where the depth and width of the valley or gorge rendered embankments impracticable. These massive, elevated structures were first built in Roman style of multiple-stone arches and piers. Later, when wrought iron and steel became available, engineers built viaducts and trestles of great length and height on a series of truss spans or girders borne by individual framed towers composed of two or more bents braced together. The Thomas Viaduct on the Baltimore & Ohio Railroad (1835) (Figure 13), the Canton on the Boston & Providence Railroad (1835), and the Starrucca on the New York & Erie Railroad (1848) are the oldest stone viaducts and three of the great monumental structures of the USA's early railways. Examples in Europe include the Viaduc de Barentine (1846), constructed by British navvies under the direction of MacKenzie and Thomas Brassey in brick rather than stone, and the Viaduc de Saint-Chamas (1847), both in France. In the United Kingdom, notable viaducts include the 181ft (55m) Ballochmyle Viaduct (1848), designed by John Miller for the Glasgow & South Western Railway, the largest masonry-arch span in the country; the Harrington Viaduct (1876), the longest at 3500ft (1067m), carried on 82 brick arches; the Meldon Viaduct (1874), the best surviving iron viaduct in Devon; and, in concrete, the Glenfinnian Viaduct (1898), which has 21 arches of mass-poured concrete. Most notable of the early trestles was the Portage Viaduct in the USA (1852), a remarkable timber structure designed by Silas Seymour, carrying the Erie Railroad over the Genessee River, 234ft (71m) above the water and 876ft (276m) long (Figure 14). It was destroyed by fire in 1875, to be replaced in iron, and later in steel. One of the first iron viaducts was the 1673ft (510m) long Crumlin Viaduct (1857), constructed by Thomas W Kennard and designed by Charles Liddell for the Newport-Hereford line, 217ft (66m) above the Ebbw Vale in Wales (UK). It served as the prototype for later ones, such as the Viaduc de la Bouble (1871), a series of lattice girders on cast-iron towers flared at the bottom, built under the direction of Wilhelm Nordling. It was 1296ft (395m) long by 216ft (66m) high on the Commentry-Gannett line in France. The first viaduct of iron in the USA was designed by Albert Fink for the Baltimore & Ohio Railroad over Tray Run in the Cheat River valley in (West) Virginia, a remote, wild, yet picturesque site in the wilderness. Dating from 1853, it was a series of inclined cast-iron columns resting on stone pedestals connected at the top by cast-iron arches, the whole system braced by wrought-iron ties. 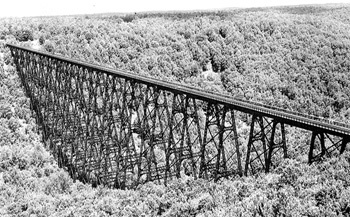 Examples surviving today in North America include the Kinzua Viaduct (1900) on the former Erie Railroad in Pennsylvania (Figure 15), and the Lethbridge Viaduct (1909) on the Canadian Pacific in Alberta, composed of alternating 67ft (20m) trestles and 100ft (30m) girders, at 5327ft (1624m) long the longest and heaviest in the world. The Tunkhannock Viaduct (1915), 240ft high (73m) by 2375ft long (724m), is the largest reinforced concrete-arch bridge in the world. Although suspension bridges had been known in China as early as 206 BC, the first chain suspension bridge did not appear in Europe until 1741, when the 70ft (21m) span Winch Bridge was constructed over a chasm of the River Tees (UK), with the flooring laid directly on two chains. It was an American, James Finley, however, who built the first practical suspension bridge in 1796 in the USA. 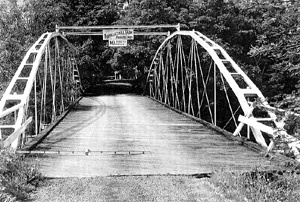 This was a bridge over Jacobs Creek near Uniontown, Pennsylvania, which Finley described as a "stiffened" bridge in an article he published in Portfolio in 1810. The span displayed all the essential elements of the modern suspension bridge: a level deck hung from a catenary system suspended over towers and anchored in the ground, and a truss-stiffened deck, resulting in a rigid bridge capable of supporting relatively heavy loads. The world's first wire-cable suspension bridge was a 408ft (124m) temporary footbridge built in 1816 for the workers of wire manufacturers Josiah White and Erskine Hazard over the Schuylkill in Philadelphia. The USA contributed little more until the middle of the century, but these inventions were immediately followed up in Europe. The French and Swiss continued to use wire cables, developing methods of fabricating the cables in situ. In 1822, Marc Séguin proposed a suspension cable made up of one hundred thin iron wires, erected his first suspension bridge (actually a catwalk like the White and Hazard bridge) over the Cance at Annonay, and proposed a major structure over the Rhône at Tournon. By scientific testing, he proved the strength of the wire cable - twice that of the English iron eyebar chain - and described all in Des ponts en fil de fer, published in 1824. The world's first permanent wire-cable suspension bridge, designed by Séguin and Guillaume-Henri Dufour, was opened to the public in Geneva in 1823, followed by Séguin's Tain-Tournon Bridge, a double suspension span over the Rhône, completed in 1825. Its 1847 replacement still stands, probably the oldest wire-cable suspension bridge in the world, with its carefully replicated wooden stiffening truss and deck. Several of Séguin's first-generation wire-cable suspension bridges, dating from the 1830s, remain over the Rhône at Andance and Fourques, but the decks have been replaced with steel. Wire cable attained its place as the system par excellence for long-span bridges in 1834, with the 870ft (265m) Fribourg Bridge, designed by Joseph Chaley over the Sarine in Switzerland. From this developed the typical European standard - cables of parallel, thin wires, light decks stiffened by wooden trusses, piers and abutments sunk - using hydraulic cement - of which hundreds were built. The British preferred to use chains of linked eyebars, and achieved spans of lightness and grace, all the more effective in contrast with the colossal masonry suspension towers. 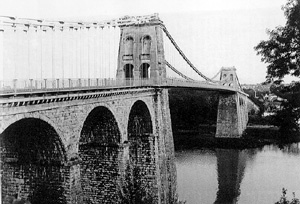 The United Kingdom's first large-scale suspension bridge was the Menai Bridge on the London to Holyhead road over the straits of the same name in North Wales (Figure 16). Travellers would board a ship at Holyhead for the final leg of the trip to Ireland. It was designed by Thomas Telford and completed in 1826, with an unprecedented span of 580ft (177m) using wrought-iron eyebars, each bar being carefully tested before being pinned together and lifted into place. The roadway was only 24ft (7m) wide and, without stiffening trusses, soon proved highly unstable in the wind. The Menai bridge was twice rebuilt before the entire suspension system was replicated in steel in 1940 and the arched openings in the towers were widened. The oldest suspension bridge extant today is the Union Bridge over the River Tweed at Berwick (UK), a chain-link bridge designed and erected by Captain Samuel Brown in 1820, with a span of 449ft (137m). With the French declaring a moratorium on suspension-bridge construction following the collapse of the Basse-Chaine Bridge in 1850, the creative edge passed back across the Atlantic, to be picked up by Charles Ellet and John Augustus Roebling in the USA. After studying suspension bridges in France, Ellet returned with the technology and built a 1010ft (308m) bridge over the Ohio River at Wheeling, (West) Virginia, in 1849, which was the longest in the world. 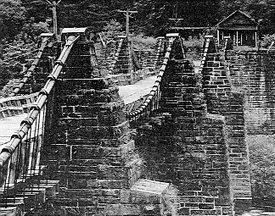 Thanks to techniques developed by the Roeblings and used in the structure's rebuilding, following a storm that ripped the cables off their saddles, the bridge remains in service today. Roebling had arrived in the USA ten years earlier and established a wire-rope factory in Saxonburg, Pennsylvania, which he later moved to Trenton, New Jersey. Educated in Europe, he would have been exposed to the concepts of wire-cable suspension bridge engineering of the French and Swiss. He and Ellet competed for primacy in suspension bridge design. Roebling won out when he took over design of the Niagara Suspension Bridge from Ellet, successfully completing it in 1855 (Figure 17). The inherent tendency of suspension bridges to sway and undulate in wavelike motions under repeated rhythmic loads such as marching soldiers or the wind was not completely understood by engineers until the 1940s, following the collapse of the Tacoma Narrows Bridge ("Galloping Gertie"). Credit for designing the first suspension bridge rigid enough to withstand wind loads and the highly concentrated loadings of locomotives belongs to John Roebling. His first masterpiece was the Niagara Suspension Bridge, with a span of 821ft (250m) on the Grand Trunk Railway below Niagara Falls. The two decks, the upper for the railway and the lower for common road service, were separated by an 18ft (6m) stiffening truss. In addition, the truss was braced with radiating cable stays inclined from the tops of the suspension towers and anchoring cables tying the deck to the sides of the gorge, arresting any tendency to lift under gusts of wind. 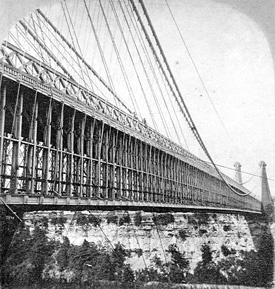 For the four main cables, Roebling used parallel wires laid up in place but, instead of individual strands like the "garland" system preferred by the French, he bunched the strands together in a single large cable and wrapped them with wire, a technique he patented in 1841 but one that Vicat had illustrated in 1831 in his Rapport sur les ponts en fil de fer sur le Rhône. Few bridges in the world built since the Brooklyn Bridge in New York (USA) can stand entirely clear of its shadow. Completed in 1883, the plan involved two distinctive stone towers, four main cables, anchorages, diagonal stay cables, and four stiffening trusses separating the common roadway and trolley line from a pedestrian promenade. With a record-breaking span of 1595ft (486m), the Brooklyn Bridge was designed by John Roebling, but it was built by his son and daughter-in-law after he died of blood poisoning following an accident while surveying the location of the Manhattan tower in which his foot was crushed. Massive Egyptian towers, pierced by pointed Gothic arches, stand 276.5ft (84m) above mean high water and 78.5ft (24m) below on the Manhattan side, 44.5ft (14m) on the Brooklyn. Diagonal stay cables give the bridge its distinctive appearance, but function to stiffen the deck. It took two years to lay up each of the four 15.75in (40cm) diameter main cables with 5434 wires, the pioneer use of steel wire (Figure 18). Two other Roebling suspension bridges survive, both recently rehabilitated. One spanning the Ohio River at Cincinnati was completed in 1867. The 1849 Delaware Aqueduct was designed to carry a wooden trunk of water on the Delaware & Hudson Canal. The latter was carefully rehabilitated by the US National Park Service and is the oldest surviving suspension bridge in the USA (Figure 19). Structural steel is stronger and more supple than cast or wrought iron, and allowed greater design flexibility. The last thirty years of the 19th century witnessed the phasing in of steel plates and rolled shapes, leading to the enormous production of steel trusses and plate-girder spans of ever-increasing lengths throughout the world. Steel arches and cantilevers were favoured for long spans because they better withstood the impact, vibration, and concentrated loads of heavy rail traffic. The earliest known use of steel in bridge construction was the 334ft (102m) suspension span across the Danube Canal (1828) near Vienna (Austria), designed by Ignaz von Mitis. The steel eye-bar chains were forged from decarburized iron from Styria. Steel halved the weight of wrought iron, but remained prohibitively expensive for another forty years before steelmaking processes such as the Bessemer and the open-hearth were perfected (it is uncertain whether the Styrian ironmasters created real steel or whether the decarburization was a mechanical process resulting in a surface-hardened steel, a kind of wrought iron rather than the mass steel that results from the Bessemer process). The first major bridge utilizing true steel was the Eads Bridge (1874), the most graceful of the Mississippi River crossings in the USA, built by the Keystone Bridge Company, which subcontracted fabrication of the steel parts to the Butcher Steel Works and the iron parts to Carnegie-Kloman, both of Pittsburgh. Its ribbed, tubular steel arch spans of 502ft, 520ft, and 502 ft (153m, 159m, and 153m) and double-decked design shattered all engineering precedents for the time: the centre span was by far the longest arch. Mathematical formulae for the design were developed by Charles Pfeiffer. The cantilever method of erection, devised by Colonel Henry Flad and used for the first time in the USA, eliminated the centring that would have been impossible in the wide, deep, and fast-flowing Mississippi. While recovering from illness in France, the designer James Buchanan Eads found the solution to sinking piers in deep water. He investigated a bridge under construction over the Allier at Vichy that used Cubitt and Wright's pneumatic caissons - floorless chambers filled with compressed air. The first major bridge of steel in France was the Viaur Viaduct (1902), a three-hinged steel arch of 721ft (220m) flanked by 311ft (95m) cantilevers. The crowning achievement of the material during the 19th century, however, was the mighty Forth Railway Bridge in Scotland (1890). Its design was motivated by the Tay Bridge disaster. About 54,000 tons of Siemens-Martin open-hearth steel were required for the 1710ft (521m) cantilever spans whose main compression struts of rolled steel plate were riveted into 12ft (4m) diameter tubes. Another authority on the effects of wind on structures was Gustav Eiffel, who conducted similar experiments in France prior to designing another of the world's great arch bridges, the 541ft (165m) Garabit Viaduct (1885) in the windy valleys of the Massif Central, though he held to wrought iron, not being convinced of the efficacy of the new material. Steel arches of enormous span were built during the first few decades of the 20th century. One of the greatest is the Hell Gate Bridge in the USA (1917), a two-hinged trussed arch, the top chord of which serves as part of a stiffening truss. Designed by Gustav Lindenthal to span the Hell Gate at the northern tip of Manhattan Island for the New England Connecting Railroad, it is framed between two massive stone towers. The 978ft (298m) arch, weighing 80,000 tons (81,280 tonnes), was the longest and heaviest steel arch in the world. 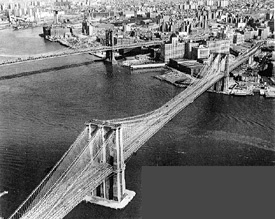 The next was Bayonne Bridge (1931), which remains one of the longest steel arches in the world today. It was built during the Depression by a team assembled under the direction of Swiss-born and educated engineer, Othmar Ammann, chief engineer of the Port Authority of New York, one of the remarkable public works organizations of the USA, if not the world. Opening three weeks after the George Washington Bridge, then the longest suspension bridge in the world, this second record-breaking span was financed and built by the Port Authority simultaneously, the two projects forming one of the greatest public work endeavours since Roman times. The Bayonne Bridge connects Bayonne (New Jersey) and Staten Island (New York) with a manganese-steel parabolic two-hinged arch of 1675ft (511m) span and 266ft (81m) rise, the deck clearing high water by 150ft (46m). As in the Hell Gate, the arch's top chord acts as a stiffener, the bottom chord carrying the load. The Bayonne Bridge was designed to be 25ft (8m) longer than the nearly identical Sydney Harbour Bridge in Australia, started five years earlier. Bridges in areas other than Europe and the USA should be investigated, as the colonial empires of several nations were at their peak during the autumn years of the 19th century. In India, for example, the British built several long-span railway bridges, such as the Hooghly and the Sukkur bridges which exceeded 1000ft (300m) in span and are interesting because they were constructed using the simplest equipment and armies of unskilled labour. This structural form was mentioned in the previous section on steel bridges in the discussion of the Eads Bridge, where the erection of the arches employed principles of the cantilever, and the Forth Railway Bridge, perhaps the world's greatest cantilever. A discussion of this type of bridge is warranted because of its engineering interest and because the form illustrates the outstanding application of iron and steel to bridge construction. Cantilevers were one of the first bridge types, many being built by the ancient cultures of China and India. The first modern cantilever was Heinrich Gerber's Hassfurt Bridge over the Main in Germany (1867), with a central span of 124ft (38m). It was a continuous girder hinged at the points of equal resistance where the moments of the uniform load were zero. According to W Westhofen, who wrote the classic account of the Forth Bridge, the idea first was suggested by John Fowler, co-designer of the Forth Bridge, around 1846-50. In Britain and the USA the form was known as cantilevers, in France as portes-à-faux, and in Germany as the Gerber Bridge, named after the builder. By inserting hinges, the continuous girder can be made statically determinant. This was their first attribute, but later as the possibility of erection without scaffolding was recognized - the ability of the arms of the bridge to be built out from the piers, balancing each other without the need for falsework. This became the great advantage. The principle also is applicable to other bridge types such as arches, an example being the Eads Bridge, where the width, depth, and current of the mighty Mississippi prevented the erection of falsework. In 1877, C Shaler Smith provided the first practical test of the principle when he built what then was the world's longest cantilever over a 1200ft (366m) wide and 275ft (84m) deep gorge of the Kentucky River near Dixville, Kentucky (USA). The cantilever resolved the difficulty of erecting falsework in a deep wide gorge. The anchor arms were 37.5ft (11m) deep Whipple trusses that extended 75ft (23m) beyond the piers. From these were hung 300ft (91m) semi-floating trusses fixed at the abutments and hinged to the cantilever, making the overall span from pier to abutment 375ft (114m). The bridge was rebuilt in 1911 by Gustav Lindenthal using the identical span lengths, but with trusses twice as deep. The next important cantilever was a counterbalanced span designed by C C Schneider for the Michigan Central Railroad over the Niagara Gorge in 1883. With arms supporting a simple suspended truss, this 495ft (151m) span and the nearly identical Fraser River span in British Columbia (Canada) directed the attention of the engineering world to this new type of bridge. These two were the prototypes for subsequent cantilevers at Poughkeepsie, New York, the Firth of Forth Bridge in Scotland, and the Québec Bridge in Canada. The Poughkeepsie Cantilever (1886) was the first rail crossing of the Hudson River below Albany, 55 miles (89km) north of New York City. Built by the Union Bridge Company of New York to designs by company engineers Francis O'Rourke and Pomeroy P Dickinson, the overall length is 6768ft (2063m), including two cantilevers of 548ft (167m) each. Strengthened in 1906 by adding a third line of trusses down the middle designed by Ralph Modjeski, citizens on both sides of the river are working to have this magnificent, but now abandoned, bridge incorporated as part of the Hudson Greenway trail system. 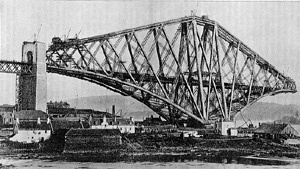 Figure 20 Forth Bridge (1890): an historic photograph showing the FifeTower at North Queensferry, Scotland (UK), nearing completion. The illustration is from Wilhelm Wethofen's article published in Engineering Magazine, 28 February 1890. The world's most famous cantilever also is one of the world's first and largest steel bridges and held the record for longest cantilever for 27 years. Pontists are familiar with the brilliant demonstration used by Sir Benjamin Baker to illustrate the structural principles of the Firth of Forth Bridge: two men sitting on chairs with outstretched arms and sticks supporting Kaichi Watanabe, a visiting engineering student from Japan, sitting on a board, representing the fixed piers, cantilevers, and suspended span. To ensure that there was no repeat of the Tay disaster, Baker conducted a series of tests, gauging wind at several sites in the area over a two-year period, arriving at a design pressure of 56lb/ft2 (274kg/m2), which was considerably in excess of any load the bridge would ever sustain. Each of the two main spans of the bridge consists of two 680ft (207m) cantilevers with a 350ft (107m) suspended span for a total length of 1,710ft (521m). John Fowler and Benjamin Baker designed the Forth Bridge (1890) to resist wind loads 5.5 times those that toppled the Tay Bridge (Figure 20). The Forth Bridge's record was broken in 1917 when the Québec Bridge was finally completed, spanning the St Lawrence River near Québec (Canada) with an 1800ft (549m) cantilever span. Its predecessor failed in 1907 while under construction, killing 82 workmen and ending the career of one of America's most prominent engineers. Theodore Cooper had taken the commission reluctantly with a fee insufficient to hire assistants, to allow for written specifications, or to provide for on-site inspections. The design was not recalculated when Cooper, intent on exceeding the span of the record-holding Forth Bridge, increased it from 1600ft to 1800ft, which was ultimately to result in the failure of one of the main compression members of the lower chord in the south anchor. The second bridge also had its problems as well when one of the jacks failed while lifting the 5000 ton centre suspended span, dropping it into the river. A duplicate truss was successfully lifted into place within two weeks and the bridge was finally opened. This bridge, designed by E H Duggan and Phelps Johnson with Ralph Modjeski as consultant, was criticized by many engineers as being the ugliest, while the cantilever was generally regarded as a type, especially those of American origin, whose profile was unsightly despite their record lengths. The largest cantilever in Europe was Saligney's Danube Bridge near Czernavoda (Romania), with a span of 623ft (190m). Another great cantilever is the Howrah Bridge over the Hooghly River at Calcutta (India), with a span of 1500ft (457m). Concrete is an ancient material. It was first discovered and used by the Romans in their aqueducts and temples, to be sporadically rediscovered throughout time by engineers who used it in its mass- poured form. The discovery of natural cement in 1796, on the Isle of Sheppey in the Thames Estuary (UK), renewed interest in the material, but the age of concrete began its most vigorous development with Joseph Aspdin's invention in 1824 of artificial Portland cement. This mixture of clay and limestone, calcined and ground, resulted in a material having broad application for buildings and bridges. The scientific studies of Vicat on natural and artificial cements initiated in 1816 at the Pont de Souillac (France) revealed the first understanding of the chemical properties of hydraulic cement. Canvass White, an engineer on the Erie Canal (USA), discovered natural cement in 1818 and established a mill to manufacture the substance at Chittenango, New York. The primary benefit of the material was its ability to set under water. Naming it hydraulic cement, he patented the process in 1819 and used it for aqueducts, abutments, culverts, and lock walls. In 1831, Lebrun, a French engineer, designed the first concrete bridge to span the River Agout, although it never was built. A significant early structural use of concrete in the USA was in 1848 for the foundations and deck of the Starrucca Viaduct on the New York & Erie Railroad, a mighty stone-arched bridge with an overall length of 1040ft (317m), designed by Julius Walker Adams and built by James Pugh Kirkwood. 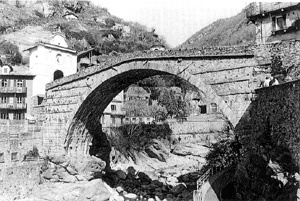 Later, the use of artificial cement combined with more sophisticated understanding of the mathematical principles of arch theory resulted in renewed interest in stone and masonry arch bridges in Europe. Beginning in the mid-19th century, masonry railroad viaducts were an important civil engineering technology for continental Europe. The most impressive were the 1969ft (600m) long Chaumont Viaduct (1857) and the 240ft (73m) high Sainte-Brieuc (Barentin) Viaduct (1860), both in France, and the Goltzschtal Viaduct in Germany, which used 26 million units of brick. The French engineer, Paul Séjourne, expressed the most elegant modern restatement of the principles of this most ancient material in his masterpiece bridges of stone, the 279ft (85m) span Pont Adolphe in Luxembourg (1903) and the bridge at Plauen, Germany (1905), which was the longest ever achieved in stone masonry, with a span of 295ft (90m). The beginning of concrete as a major material of bridge construction dates from 1865, when it was used in its mass, unreinforced form for a multiple-arch structure on the Grand Maître Aqueduct conveying water from the River Vanne 94 miles (151km) to Paris. Engineers in the late 19th century demonstrated the possibilities of reinforced concrete as a structural material. With concrete resisting compressive forces and wrought iron and steel bars carrying tension, bridges of dramatic sweeping curves evolved. Today's long-span reinforced- concrete bridges are descended from French gardener Joseph Monier's flower pots and his numerous bridge patents granted between 1868 and 1878. He is credited with being the first to understand the principles of reinforced concrete when in 1867 he patented plant tubs of cement mortar strengthened with iron-wire mesh embedded in the concrete and moulded into curvilinear forms. Not being an engineer, he was not permitted to build bridges in France and so he sold his patents to German and Austrian contractors Wayss, Freitag and Schuster, who built the first generation of reinforced concrete bridges in Europe: the Monierbrau 131ft (40m) footbridge in Bremen (Germany) and the Wildegg Bridge, with a span of 121ft (37m), in Switzerland. Additional patents were granted in Belgium, France and Italy, especially to the Frenchman François Hennebique, who established the first international firm to market his bridges before World War I. His first masterpiece was built at Millesimo (Italy) in 1898, and that at Châtellérault in France (1900) remains as one of the first notable reinforced concrete arch bridges in the world, with a central span of 172ft (52m) and two lateral arches of 131ft (40m). In 1912, Hennebique set a new world record with a bridge over the Tiber in Rome (Italy) with a span of 328ft (100m). Other important three-span bridges with impressive central spans were built in France by Eugène Freyssinet, such as the bridges at Veurdre (1910) and Boutiron (1912). In France, where much of the original thinking on reinforced concrete occurred, the record span was the Saint-Pierre du Vauvray Bridge (1922) by Freyssinet. He perfected the technique of prestressing concrete by inserting hydraulic rams in a gap left at the crown of arches, then activating the rams to lift the arches off the falsework and filling the gap with concrete, leaving only permanent compressive stresses in the arches. The Vauvray Bridge over the Seine was the record span at 430ft (131m), the deck being hung from hollow cellular arch ribs on wire hangers, coated with cement mortar, and supporting the road on light concrete deck trusses. The Vauvray Bridge was destroyed in World War II, leaving the Plougastel Bridge (1930) over the River Elon at Brest, with three spans of 567ft (173m), as the longest reinforced concrete arch span until 1942. Swiss engineer Robert Maillart designed three-hinged arches in which the deck and the arch ribs were combined to produce closely integrated structures that evolved into stiffened arches of very thin reinforced concrete and concrete slabs, as at the Schwandbach Bridge (1933), near Schwarzenbach (Switzerland). Maillart's early apprenticeship with Hennebique sharpened his awareness of the plastic character of the material. His profound understanding of reinforced concrete allowed him to develop new, light, and magnificently sculptural forms. Maillart's bridges are of two distinct types: stiffened-slab arches and three-hinged arches with an integrated road slab. The 295ft (90m) Salginatobel Bridge (1930) near Schiers (Switzerland) is the most spectacular and classic example of this type in the world. The world's longest concrete and masonry arch bridge is the Rockville Bridge (1902), which carries four tracks of the former Pennsylvania Railroad over the Susquehanna River (USA) on 48 arches, 70ft (21m) each, for a total length of 3820ft (1164m). It was part of a massive twenty-year improvement programme under the direction of William H Brown, chief engineer. The largest all- reinforced concrete bridge, however, is the Tunkhannock Viaduct (1915) built by the Delaware, Lackawanna & Western Railroad in north-eastern Pennsylvania (USA), composed of ten semi-circular double-arch spans of 180ft (55m) with the spandrels filled with eleven smaller arches. Like Rockville, it was a major component in another early 20th century US railroad improvement project, this time a massive realignment. Abraham Burton Cohen was the rail line's designer of the reinforced-concrete bridges. The first major reinforced-concrete bridge in the United Kingdom was the Royal Tweed Bridge (1928), made up of four rhythmic open- spandrel arches filled with vertical posts increasing in span from 167ft (51m) to 361ft (110m) as the roadway climbs from low to high embankments on each side of the river. Sweden is another country that excelled in building elegant and innovative reinforced-concrete arch bridges of extremely long span. The first was the Traneberg Bridge (1934) in Stockholm, designed by Harbour Board engineers Ernst Nilsson and S Kasarnowsky with Eugène Freyssinet consulting. Its 593ft (181m) span was surpassed briefly in 1942 by the Esla Bridge in Spain with a span of 631ft (192m), but within the same year the title for the longest arch was regained for Sweden by S Haggböm with the Sando Bridge, the longest reinforced- concrete arch in the world at 866ft (264m). This essay ends with two of the oldest types of bridges known to humankind. The bascule or draw span was developed by Europeans during the Middle Ages. 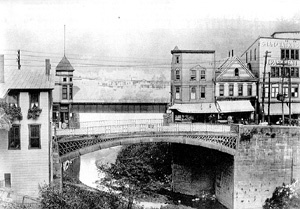 There was a resurgence of moveable bridges during the late 19th century. Reliable electric motors and techniques for counterbalancing the massive weights of the bascule, lift, or swing spans marked the beginning of modern moveable-bridge construction. They are usually found in flat terrain, where the cost of approaches to gain high-level crossings is prohibitive, and their characteristics include rapidity of operation, the ability to vary the openings depending on the size of vessels, and the facility to build in congested areas adjacent to other bridges. Completion of Tower Bridge over the Thames in London (1894), a 260ft (79m) roller-bearing trunnion bascule and the best known bascule bridge in the world, and Van Buren Street Bridge in Chicago, the first rolling lift bridge in the USA (patented by William Scherzer), marks the efficient solution to problems of lifting and locking mechanisms. In 1914, the Canadian Pacific Railroad completed the world's largest double-leaf bascule, spanning 336ft (102m) over the ship canal at Sault-Sainte-Marie, Michigan, rebuilt with identical spans in 1941. The Saint Charles Airline Railway Bridge (1919) spanning 16th Street in Chicago was at 260ft (79m) the longest single-leaf bascule when it was completed. In 1927, the Atchison, Topeka & Santa Fe Railroad built the world's longest single-span swing bridge, 525ft (160m), over the Mississippi at Fort Madison, Iowa. One of the most interesting and unusual moveable bridges is the Lacey V Murrow Bridge (1940), whose design reached back to the pontoons built by Roman legions. The depth and breadth of the lake precluded the construction of conventional piers on pilings, cantilever, or suspension spans, and so Washington State bridge engineers designed a floating bridge supported by hollow concrete pontoons to connect Seattle and Mercer Island. Equally unique was the retractable floating draw span for ocean-going ships in the lake. Three other bridges of this type were completed over the Hood Canal (1961) and at Evergreen Point (1963). A span parallel to the Murrow Bridge now carries the increased traffic of Interstate Highway 90. A comparable example of an unusual type of moveable bridge in Europe is the transporter bridge, where a platform suspended by cables from tall towers and superstructure is carried on an overhead framework. This type of bridge also reaches back into history, integrating ancient technology such as the rope ferry with new structural forms and materials such as the iron beam and the strongest steel cables. The transporter bridge was the original solution to spanning the mouth of a river or entrance to a harbour and also served as a monumental gateway. Although it was patented in the UK and the USA in the mid 19th century, the first significant example was built by French engineer Ferdinand Arnodin, at Portugalete (1893) in Spain. 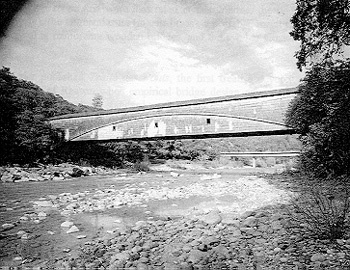 Arnodin also invented the twisted steel cable, an important innovation for this type of bridge. The only other survivors are located in the United Kingdom at Middlesbrough and Newport (Wales) and at Martrou (France). The author deeply appreciates the review and comments on this essay by the following individuals: Dr Shunsuke Baba (Faculty of Environmental Science and Technology, Okayama University, Japan), Professor Louis Bergeron (École des Hautes Études en Sciences Sociales, Paris, France), Sir Neil Cossons (Director, Science Museum, London, UK), Dott. Roberto Gori (Università di Padova, Italy), Dr Emory Kemp (Director, Institute for the History of Technology and Industrial Archaeology, West Virginia University, USA), Dr Michael Mende (Hochschule für Bildende Kunst, Braunschweig, Germany), David Simmons (Editor, Timeline, Ohio Historical Society, Columbus, USA), Dr Itoh Takasaki (Research Institute of Science and Technology, Nihon University, Japan), and Robert Vogel (Curator Emeritus, Museum of American History, Smithsonian Institution, Washington, DC, USA). He is especially indebted to Michel Cotte (Tournon, France), whose review provided insights on bridge types, chronological structure, and other subtleties of European bridge history that the author was not aware of. His thorough review gives this paper a solid European foundation. Bridges marked (*) were suggested by Michael Mende. The Pont du Gard (France), the Segovia Aqueduct (Spain), and other Roman and Renaissance bridges in the historic centres of Rome, Florence, and Segovia are already on the World Heritage List. Primitive bridges, if any survive, may be candidates for World Heritage listing because they illustrate primitive ingenuity and craft technology, which it is important to recognize and preserve. The Phra Bhutthos (Cambodia), the Jiangdonggiao (China), the Ponte Saint-Martin (Italy), the Steinerne Brücke (Germany), Pontypridd Bridge (UK), Rumlangsbrücke (Switzerland), the Menai Suspension Bridge (UK), the Puente Ferroviario de Dona Maria Pia (Italy), Strömsund Bro (Sweden), the Pont Rail Gisclard, and Acueducto de Tempul (Spain) were suggested by Professor Shunsuke Baba. Stone girder of 76ft (23m) span, total length of bridge 920ft (281m). The Ponte Vecchio and the Ponte Santa Trinità form part of the Florence World Heritage site. The Ponte Vecchio replaced a similar bridge that failed in 1333. Some authorities attribute its design to Fra Giovanni da Campi rather than the architect Taddeo Gaddi. The Pont Neuf and several other bridges over the Seine form part of the Paris - Banks of the Seine World Heritage site. Several collections of cast-iron arches survive in different countries. The largest is in England, there are six in the USA, a few in France, and a remarkable selection in Russia, all of which could be studied as a specific type with the object of possible eventual World Heritage nomination. Most of these bridges were designed by Friedrich Wilhelm von Erdmannsdorf and not all are iron. They include the Roman Bridge (1788), the tree-trunk Hornzachenbrücke (1774), the Treppenbrücke, based on the Mathematical Bridge in Cambridge (1773), the Wolfsbrücke (1811), the Chinese Chain Bridge (1781), the Sun Bridge (1796), and the Iron Bridge (1791). A case for the world significance of this bridge was made by Stephen Hughes of the Royal Commission on the Ancient and Historical Monuments of Wales. This and the Acueducto de Tempul, designed by Albert Gisclard and Eduardo Torroja respectively, are possible candidates for listing as early cable-stayed suspension bridges. A suspension ferry (transporter bridge) 525ft (160m) long by 141ft (43m) high. Condit, Carl W American Building Art, 19th & 20th Century, 2 volumes, Oxford University Press, New York, 1961. DeLony, Eric Landmark American Bridges. American Society of Civil Engineers, New York; Bullfinch Press, Little Brown Publishing Company, Boston, 1993. DeLony, Eric World Timetable of Bridges. Unpublished manuscript, 1997.
de Jonge, Riveted Joints: A Critical Review of the Literature Covering their A E Richard Development, with Bibliography and Abstracts of the Most Important Articles. The American Society of Mechanical Engineers, New York, 1945. Du Bois, A J The Elements of Graphical Statics and Their Application to Framed Structures. John Wiley & Son, New York, 1875. Edwards, A Record of History & Evolution of Early American Bridges, University Llewellyn N of Maine Press, Orono, 1959. Haupt, Herman General Theory of Bridge Construction. D Appleton & Company, New York, 1851. Hool, George A Moveable and Long-Span Steel Bridges. (1st ed) McGraw-Hill Book & Kinne, W S (eds) Company, New York, 1923. Jackson, Donald C Great American Bridges & Dams. The Preservation Press, Washington, DC, 1988. Jakkula, A A A History of Suspension Bridges in Bibliographical Form. Bulletin of the Agricultural and Mechanical College of Texas, Fourth Series, vol 12, no 7, July 1, 1941. Federal Works Agency, Public Roads Administration, Washington, DC. 1941. Ketchum, Milo S The Design of Highway Bridges. The Engineering News Publishing Company, New York, 1908. Mahan, D H A Treatise on Civil Engineering. J Wiley & Sons, New York, 1873. Melan, Joseph Plain and Reinforced Concrete Arches. (1st ed) John Wiley & Sons, New York, 1915. Parsons, Engineers and Engineering in the Renaissance. William & Wilkins, William Barclay Baltimore, 1939. Peters, Tom F Transitions in Engineering. Birkhauser Verlag, Basel, Switzerland and Boston, 1987. Plowden, David Bridges: Spans of North America. The Viking Press, New York, 1974. Pope, Thomas A Treatise on Bridge Engineering. Printed for the Author by Alexander Niven, New York, 1811. Schodek, Daniel L Landmarks in American Civil Engineering. MIT Press, Cambridge, MA and London, 1987. Smith, H Shirley The World's Great Bridges. Harper & Row, New York, 1965. Steinman, D B A Practical Treatise on Suspension Bridges. John Wiley & Sons, New York, 1922. Stephens, John H Towers, Bridges, and Other Structures. Sterling Publishing Company, New York, 1976. Waddell, J A L The Designing of Ordinary Iron Highway Bridges. John Wiley & Sons, New York, 1894. Watson, Wilbur J Bridge Architecture. William Helburn Inc, New York, 1927. Whitney, Charles S Bridges: A Study in Their Art, Science and Evolution. William Edwin Rudge, New York, 1929. Woodward, A History of the St. Louis Bridge; Containing A Full Account of Every Calvin Milton Step in its Construction and Erection, and Including the Theory of the Ribbed Arch and the Tests of Materials. G I Jones & Company, St Louis, 1881. Burnell, George R, Supplement to the Theory, Practice and Architecture of Bridges. John ed Weale, London, 1850. Cossons, Neil The BP Book of Industrial Archaeology. David & Charles, Newton Abbot, London, North Pomfert (VT), 1987.
de Maré, Eric Bridges of Britain. B T Batsford Ltd., London & Sydney, 1975. Dempsey, Tubular and other Iron Girder Bridges, Particularly Describing the G DrysdaleBritannia and Conway Tubular Bridges. John Weale, London, 1850. Fidler, T Claxton A Practical Treatise on Bridge-Construction. Charles Griffin & Co., London, 1887. Hopkins, H J A Span of Bridges: An Illustrated History. David & Charles, Newton Abbot, Devon, 1970. Hosking, William Bridges: In Theory, Practice, and Architecture. John Weale, London, 1839. James, J G The Evolution of Iron Bridge Trusses to 1850, The Newcomen Society Transactions, vol 52, 1980-81, London, 1982. Kemp, Emory L Thomas Paine and His Pontifical Matters, ibid, vol 49, 1977-78, London, 1979. Richards, J M The National Trust Book of Bridges. Jonathan Cape, London, 1984. Weale, John, ed The Theory & Practice and Architecture of Bridges of Stone, Iron, Timber & Wire with Examples on the Principle of Suspension, Vol.1. John Weale, London, 1843. Westhofen, W The Forth Bridge. Reprinted from Engineering, February 28, 1890, London, 1890. Wright, Lewis The Clifton and Other Remarkable Suspension Bridges of the World. John Weale, London, 1865. Annales des Ponts et Chaussées, Célébration du 150e Anniversaire (1831-1981) de la Fondation de la Revue, No.19, 3e Trimestre, Paris, 1981. Aragon, E Ponts en bois et en métal, Bibliothèque du Conducteur de Travaux Publics, H Dunod et E Pinat, Éditeurs, Paris, 1911. Cotte, Michel Le système technique des Séguin en 1824-1825, History & Technology, 7-2, (pp 119-147), 1990. Cotte, Michel L'accident du Pont Angers, Revue, Musée des Arts et Métiers, pp 4-15, 5 décembre 1993. École Nationale des Ponts et Chaussées, No 14, Paris, octobre 1961. Grattesat, Guy Ponts de France. Presses de l'École Nationale des Ponts et Chaussées, Paris, 1982. Marrey, Bernard Les ponts modernes: 18e-19e siècles, Picard Éditeur, Paris, 1990. Mesqui, Jean Le pont en France avant le temps des ingénieurs, Picard, Paris, 1986. Perronet, J R Description des projets et de la construction des Ponts de Neuilly, de Mantes, d'Orléans, de Louis XVI, etc, de l'Imprimerie de François-Ambroise Didot, Paris, 1788. Picon, Antoine L'invention de l'ingénieur moderne: l'École des Ponts et Chaussées (1747-1851), Presses de l'École Nationale des Ponts et Chaussées, Paris, 1992. Polonceau, A R Nouveau système des ponts en fonte, suivi dans la construction du Pont du Carrousel, Carilian-Goeury et Dalmont, Éditeurs, Libraires des Corps Royaux des Ponts et Chaussées et des Mines, Paris, 1839. Prade, Marcel Les ponts monuments historiques. Brissaud, Poitiers, 1986. Prade, Marcel Ponts et viaducs au XIX siècle. Brissaud, Poitiers, 1987. Prade, Marcel Ponts remarquables d'Europe. Brissaud, Poitiers, nd. Prade, Marcel Les grands ponts du monde: hors de l'Europe. Brissaud, Poitiers, 1992. Boeyng, Ulrich Die ältesten eisernen Brücken der Deutschen Bundesbahn in Baden-Württemberg. Sonderforschungsbereich 315 der Universität Karlsrühe, Karlsrühe, 1988. Leonhardt, Fritz Brücken, Bridges. The MIT Press, Cambridge, MA, 1984. Mehrtens, Georg Der deutsche Brücken im 19. Jahrhundert (Reprint of 1900 edition). Düsseldorf, 1984. Wittfoht, Hans Building Bridges: History, Technology, Construction. Beton- Verlag, Düsseldorf, 1984. Bill, Max Robert Maillart. Girsberger, Zürich, 1955. Killer, Josef Die Werke der Baumeister Grubenmann. Zürich, 1959. Pottgiesser, Hans Eisenbahnbrücken aus Zwei Jahrhunderten. Basel, 1985. Jodice, R L'architettura del ferro, l'Italia. Bulzoni, Roma, 1985. Siviero, E Il ponte e l'architettura. Città Studi Edizione, Milano, 1995.